I’m a big fan of counseling. Whether you are dealing with a major psychological problem, or just want some help working on some personal issues, meeting with a professional counselor can be a great way to get the help you need. I’ve had a lot of experience with counseling over the years. I’ve been involved in my own counseling as a client, I’m a licensed clinical psychologist, and I teach and train graduate students in counseling. How Do You Choose a Counselor? But how do you choose a counselor? What should you be looking for? If you live in a rural community, you might not have many options. But if you live in a big city, there might be hundreds of counselors to choose from. How can you pick the counselor that is right for you? Is the counselor licensed? What is their level of education? It’s a good idea to look for a licensed psychologist, counselor, or social worker. In order to get licensed, counselors have to go through a masters or doctoral program, take a bunch of counseling classes, pass qualifying exams, and have a certain number of supervised clinical hours. If a counselor is licensed, you know that they have at least a baseline level of education and experience. It doesn’t necessarily mean they are a good counselor, or that they are the right counselor for you. But it’s a good place to start. Can you afford the counselor? Does the counselor take your insurance? 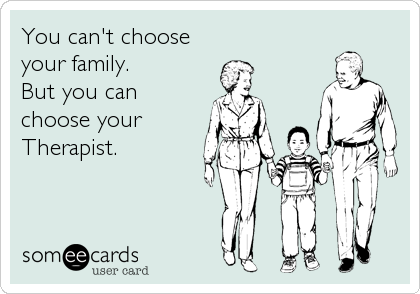 Counseling can be expensive. Some counselors are more affordable than others. Some counselors offer a sliding scale based on your income. Using your health insurance can be a great way to help pay for counseling. Some counselors take insurance, and some don’t. Before you commit to a counselor, get clear on the issue of money and fees. Make sure you can afford the counselor. Does the counselor have experience in your presenting problem? Counselors have different areas of expertise. It is important to ask whether the counselor has experience treating the problem you are dealing with. For example, if you are struggling with an eating disorder, does the counselor have training and experience treating clients with eating disorders? If you want counseling to help your marriage, does the counselor have training and experience working with couples? A licensed counselor is ethically required to operate within their competence. This means that if the counselor doesn’t feel they have the necessary training and experience to treat your problem, they are required to be honest about their limitations and either get the extra training necessary or refer you to a different counselor who can help you. How is the working alliance? The working alliance is a fancy term for the quality of the relationship between the counselor and client. It has three main parts: (1) bond (i.e., how close do you feel to your counselor? ), (2) goals (i.e., do you agree on what you are trying to accomplish in counseling? ), and (3) tasks (i.e., do you agree on what you should be doing in the counseling session?). The working alliance is one of the strongest predictors of improvement and satisfaction in counseling. If you don’t feel a good working alliance with a counselor, they might not be the right one for you. Don’t be afraid to interview a few counselors to find someone you connect with. In regular life, you won’t connect with each person you meet. Similarly, in counseling, you won’t feel a connection with every counselor. If something doesn’t feel right, try a different counselor and see if there is a better connection. Discussion: What do you think of the 4 key questions for choosing a counselor? Has it been difficult or easy for you to find a counselor you connect with? What other questions do you think are important when choosing a counselor? Having a counselor for my troubled brother-in-law who came from duty will be worth it if the professional counseling service is worth the price since I know that they can be expensive. I will have to look for a list of counselors who have a license near him if possible. Inquiring if the counselor has any specialties or experiences with his problem would also be helpful like you said.